Just like the other three factions, the Foehn Revolt has its own Construction Yard, which is the most important structure in a base. 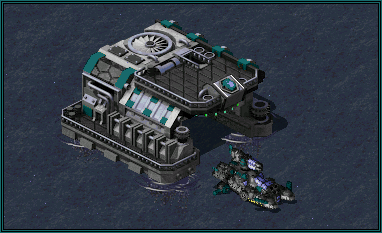 With at least one of these, a commander has the capabilities to constructall Foehn buildings and defenses. This makes the Construction Yard a high priority target for enemies, and must be defended as such in order to maintain any major presence on the battlefield. A Construction Yard provides a small amount of power as well. Foehn buildings and defenses are quite power hungry. The advanced technologies of the Revolt require lots of energy to be created and maintained so there was a need to design a power plant which would fullfil most of the requirements on the go as soon as a new outpost, the beginning of a new base construction, takes place. This is where Foehn's high-level understanding of the forces of nature, revolving around the creation and flow of winds comes in handy - a power plant that traps the wind and, by using complicated methods, is able to produce power due to its constant flow. Windtraps are larger and more expensive than all the other power plants, but produce more energy than an average one. The unusually extensive Foehn Barracks are a gate to their underground facilities, where most of the Revolt's infantry training and weapon assembling is taking place. These uniquely designed Barracks allow a commander to train basic and advanced Foehn infantry. Its presence also allows for the construction of basic defenses. The more Barracks are on the field, the faster infantries are trained. 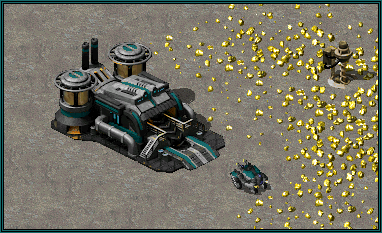 The Ore Refinery is a technologically complex building completely outfitted to receive and process raw ore from miners and instantly receive monetary transactions for the ore while on the battlefield. This makes this structure a vital asset to any base economy. The Foehn Ore Refinery is cheaper than all the other ones as the Minermite unit it comes with is noticeably less costly to produce than the standard harvesters. 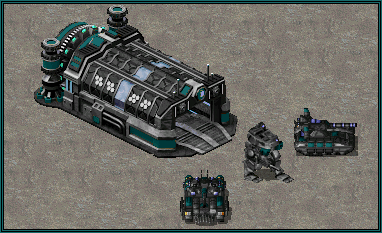 The War Factory allows for the production of Foehn's expensive and technologically advanced units on the battlefield. It is also the only place that the Foehn can construct their aircraft at, since they do not require an airfield for such units to repair and reload at. 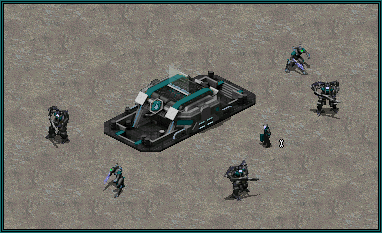 The more War Factories a commander has on the field, the faster vehicles are built. Can be infiltrated to acquire veteran unit production. A must on any battlefield with large bodies of water. The Foehn Naval Shipyard allows for the construction of Foehn ships and submersibles, and easily repairs any damaged vessels. The more Shipyards a commander has on the field, the faster ships are built. To expand their network of influence beyond the Last Bastion's area, the Foehn Revolt aims to construct more Cyberkernels around the world. 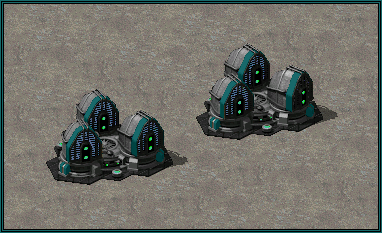 These structures are their intel collection hubs, communication centers and supercomputers in one, making them an important target for Foehn's enemies. In addition to enabling some of the advanced technology, the Cyberkernel provides access to the radar and the scouting support power in the form of Recon Sortie, which summons two drones that will reveal the shroud in a straight line of their flight. To acquire full technology access, Haihead needs to add an Expansion to the Cyberkernel, which becomes available after all three of Foehn's technology structures have been built. Use this to remove shroud from the battlefield in any place you want. Can be fired through the radar. The Cloud Piercers are where the Foehn's prime and innovative wind manipulation technologies are being developed. The Revolt's staff within these towers monitor the behavior of winds nearby and perform complicated calculations which allow their army to make the best use of its flow and employ the forces of nature in battle. The Piercer's data makes it possible to assess the best locations for the deployment of Spinblades, which will boost the speeds of units equipped with windspin engines. To acquire full technology access, Wings of Coronia need to add an Expansion to the Cloud Piercer, which becomes available after all three of Foehn's technology structures have been built. Use this to deploy a Spinblade structure, which will temporarily boost the speed of windspin-compatible units which get near one of these by approximately 75 percent. During the time of the Conscious Slumber, the Foehn Revolt has heavily focused on enhancing and developing new uses for the state-of-the-art nanotechnology, their founder being the co-inventor of it. The Revolt has many uses for the nanites it produces, be it for enhancing their armors, regenerating from all the damages taken during the battle or even for combat purposes. However, one of the most ingenious methods of putting the nanites to good use is the Nanofiber Sync, a rapid material transformation which is usually developed at the Foehn's Nanofiber Loom. Created at Foehn's many production plants, the nanites, which get transported to the Nanofiber Looms, begin work on thin but resistant and versatile nanofibers, which at the end of the production process are additionally enhanced with a batch of nanites responsible for control of the fiber's "behavior". These newly created materials are then applied to the adaptable powersuits and outfits of the Foehn infantry through the use of the Nanofiber Sync, which usually results in a transformation of the equipment that can go as far as repurposing a soldier's weapons entirely. To acquire full technology access, Last Bastion needs to add an Expansion to the Nanofiber Loom, which becomes available after all three of Foehn's technology structures have been built. Can be infiltrated to reset this support power's timer. Use this to apply a solid dose of active nanofibers to the Foehn infantry in a small radius, which will result in a significant and sometimes even role-changing upgrade to their equipment and outfit. Note that a transformed soldier will have to collect experience with the new outfit/weapon from zero. To acquire full access to their technology, each of the Foehn Revolt's subfaction must upgrade a technology building which corresponds to its technology and strategy choice. This is why Haihead will aim to construct an Expansion for the Cyberkernel, the Wings of Coronia will upgrade the Cloud Piercer and the Last Bastion will focus on developing an addition to the Nanofiber Loom. Each of the upgrades requires construction of all three major technology buildings of Foehn beforehand and each will additionally provide unique support powers for the commanders to use. This support power is unique to Haihead and requires a Cyberkernel Expansion. 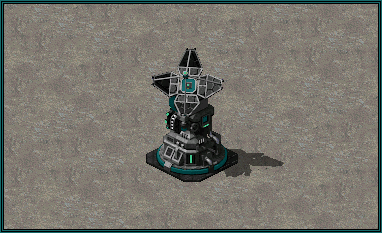 Use this to fire a Blackout Missile from the Cyberkernel, which will temporarily shut down any enemy structures in a small area after it reaches its target. The effect will last for 22 seconds. Use this to deploy a Megaarena Projector anywhere on the battlefield. The Projector will cast a powerful reactive shield on all Megalodons in its vicinity. The shield will evaporate any infantry that comes in contact with it, with the exception of heroes. It will also give Megalodons 50% more resistance to damage. The effect wears off if a Megalodon leaves the Projector's range or the Projector is destroyed. 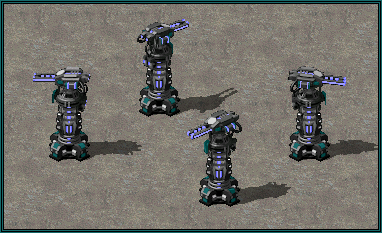 The Signal Jammer will prevent the use of support powers and superweapons, with the exception of scouting powers in the designated area for a moderate period of time. This support power is unique to Wings of Coronia and requires a Cloud Piercer Expansion. Use this to generate a projectile-jamming shield underneath all of the Quetzals under your and your allies' control. This shield will make them 6x more resistant to any damage for 20 seconds. This support power is unique to Last Bastion and requires a Nanofiber Loom Expansion. With the use of Nanocharge, all Mastodons and Leviathans will release nanites in order to repair themselves and all the friendly units nearby. The nanites will be able to repair not only all sorts of mechanical units but also any type of Foehn infantry. Other infantry will not be affected. Use this to call in a Cargo Plane which will quickly drop two Sweepers anywhere on the battlefield. While the Foehn Revolt has many nanite production plants in the Last Bastion and aboard the Coronia, a problem arises whenever a new outpost is being established somewhere in the world. With the continuous and relentless attacks on the new settlements, it often becomes too dangerous to construct an expensive plant in an area where it could be easily destroyed. 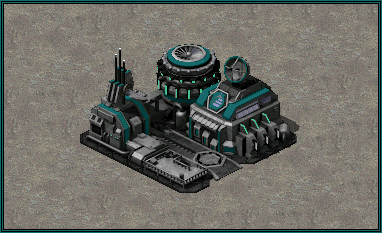 That's where the Reprocessor comes in: a structure that has been designed to provide the vital amount of nanites specialized in one purpose: material gathering.While the primary purpose of nanites in the Foehn Revolt is to perform efficient weapon and building constructions, with the limited access to the world's resources, the material gathering often becomes the more pressing task. 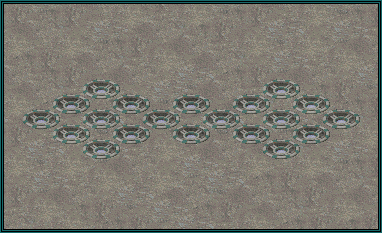 The Reprocessor focuses on creating nanites for all of Foehn's units in order to allow them to quickly pick up salvageable materials from destroyed enemy objects, be it tanks, troops' outfits or even buildings. Once the Reprocessor has been built, whenever an enemy object is killed, a small portion of its worth in resources will be awarded to the Foehn's commander who destroyed the object. To defend against at least some of potential attackers, the Reprocessor can now and then launch a small cloud of nanites at the enemy infantry in order to have them "devoured". A cloud of grey goo created from such an attack is useful to the Foehn infantry, as they can use it to perform quick regeneration of their equipment inside them, just like in the clouds created by the Huntresses. For every object destroyed with units, the owner will get 25% of its worth in resources. For every hero or special destroyed with units, the owner will get 50% of its worth in resources. Use this to fire nanites at the enemy infantry in order to heavily damage or even quickly kill them. The clouds created through killing of enemy troops contain resources that can be used by the Foehn infantry to regenerate when they move inside them. The Foehn Revolt knows quite a respectable array of methods to use their air manipulation technology. One of the more dangerous ones involves a controlled eruption of incredibly destructive steam which is kept at high pressure in the structure called the Blast Furnace. This building is partially responsible for the burning of the unused material residue that even Foehn's nanomachines can't reprocess. These materials are burned at incredibly high temperatures, resulting in lots of strong steam being produced and condensed at the Blast Furnace. At the right moment, this steam is moved into the Blast Trenches built all around Foehn bases, which then release it up high at great velocity. The windflow manipulation fittings along the Blast Trench make it possible to increase the power and reach of the barrier created in the process. Almost no ground or air unit is capable of crossing an actively erupting Blast Trench, with a few exceptions. The barrier, christiened the 'Blasticade', unfortunately has a few drawbacks, the biggest one being it getting shut down the moment a Foehn base goes low on power. If that happens, the Blast Furnace's release mechanism triggers an emergency shut down as without the ability to control the blast's flow it would be too dangerous to move it through the Blast Trenches around the base. The Blast Furnace needs to recharge the Blasticade all anew when that happens. Blasticade will go offline if the Furnace gets depowered during its activation. Blast Furnace will start charging from the beginning if the Furnace gets depowered. Whenever the Blasticade is activated, all Blast Trenches will start a very strong and controlled steam eruption, which will kill anything that comes in contact with, be it on the ground or in the sky. While usually the ground units will try to avoid going into an active Blast Trench, the same cannot be said about most of the air units which are unable to detect this steam eruption in time. Once activated, the Blasticade will be active for 2 minutes and will only start recharging once the barrier disappears. 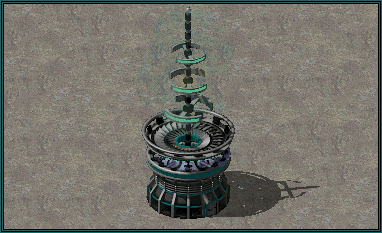 The Tempest Architect is Foehn's supreme wind manipulation device, likely to have been partially based on the blueprints of the Weather Control Device. However, to counter the Allied superweapon's random factors, the Tempest Architect's superweapon strike is precise and deadly. When the Architect gathers the winds within a vortex, it is capable of unleashing a destructive energy which will continuously deal damage to a designated area for a short period of time, taking down the sturdiest of buildings, vehicles and aircraft alike. Unleash a devastating hurricane upon your enemies, which will remain active in the selected area for a short while and deal lots of damage to anything that approaches or already is in it. Bastion Walls are the last line of defense for a Foehn commander. Cheap and quickly built, they serve as an early deterrence to infantry and light vehicles. Essential for protecting vulnerable structures against infiltration or capture. The Sonic Emitter fills the basic defense slot in Foehn's tech tree with a twist. 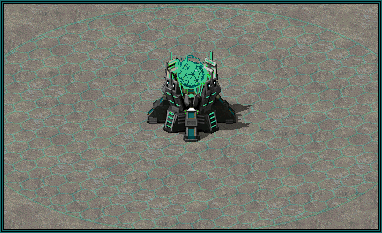 It is the only basic defense capable of firing through walls, thanks to the design of its weapon: a sonic wave which is sent through a uniquely designed crystal that amplifies its power and makes it deadly to enemy infantry and quite devastating to light vehicles as well. This ability comes at a cost: it is slightly more expensive than, for example, Pillbox or Sentry Gun and requires power to function. Dig a deep, reinforced hole in the ground, hide a small drone in it and you've got Foehn's basic anti-aircraft defense: the Shrike Nest. The Shrike hides within these holes, waiting for enemy aircraft to approach and once they get in the Nest's range, it launches and begins its pursuit. This small drone will fire a bunch of the infamous 'Golden Rockets' at the enemy, before returning to the Nest to reload. 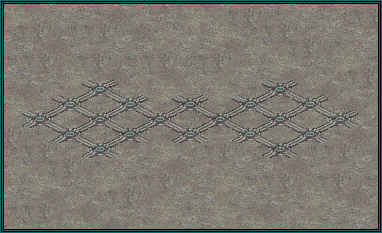 The big advantage in the use of the Shrike Nest over the more ordinary anti-air defenses is that once a Shrike locks on an aircraft, it will pursue it even if said unit leaves the Nest's range. The Shrike will keep firing until it runs out of ammo. Shrike's firepower can be enhanced by 15% near a deployed SODAR Array. The Stun Grids are dangerous traps, unseen to the enemy unless they have a cloak detector in their strike force. 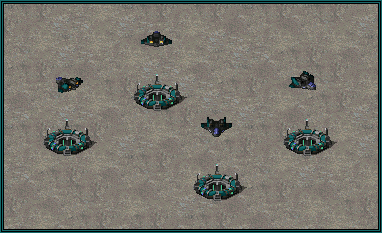 Once an infantry steps on any of the Stun Grid's segments, the Grid will reveal itself and trap the poor soul until the Grid itself is destroyed or the Foehn base goes low on power. Killing a trapped soldier in the Grid with most of weaponry will result in the Grid taking damage, so it will become necessary to replace broken spots every now and then. The Stun Grid will automatically catch enemy spies and other disguised troops. 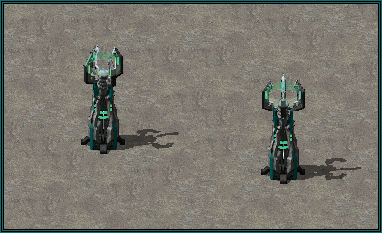 Can detect enemy spies and cloaked units. Will be placed as a 1x1 object to fill nearby free 8 cells with the grid's segments. 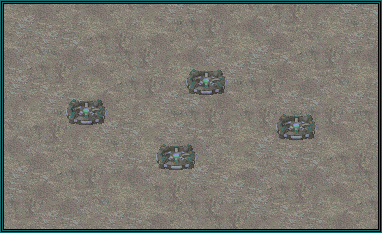 The Turmoil Grid does not trap soldiers but instead applies a quick confusion shock to any unit or infantry that moves through it. 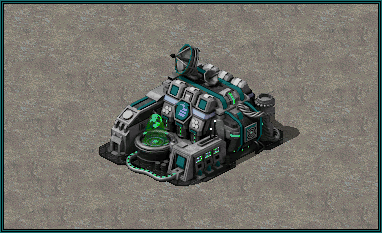 The affected unit will continue to have the confusion effect reapplied until it leaves the Turmoil Grid's area or the base goes low on power. Just like the Stun Grid, the Turmoil Grid will automatically react to spies and other disguised infantry. The Railgun Tower is the Foehn Revolt's advanced defense which becomes available once the Cloud Piercer has been built. 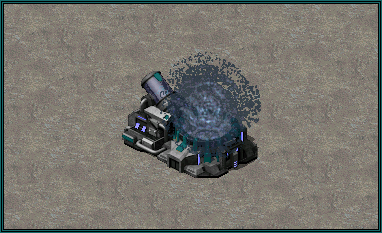 With a smaller but still powerful version of the Mastodon's plasma railgun, it is capable of dealing plenty of damage to enemy vehicles and can affect several of them at once in a small area. Compared to the other advanced defenses it is weaker against infantry, which is why you should combine varying elements in your defensive constructions. The nanites can not only be used for building construction but also for strenghtening their armor and making them more resistant to damage. The Nanocoat Regulator can create thin layers of protective coating made from nanofibers and place it on structures nearby. This will result in these buildings being able to take up to 50% more damage than usual. The effect does not overlap so it is not recommended to build the Nanocoat Regulators close to each other but at strategic positions instead. If the base is on low power, the effect wears off. Increases strength of buildings in its vicinity by 50%. Among the advanced long-range defenses which usually become available for an army that has achieved full technology access, the Neutralizer is the odd one. Its weapon, dual plasma cutters, does not have a splash, unlike all the other defenses of this tier. It does not damage units in an area but instead continuously deals damage over time with high precision. The plasma cutters make quick work of enemy mechanised divisions, one by one, and never miss their target. What connects all of these advanced long-range defenses is their design flaw, their blind spot, right around the cannon itself. 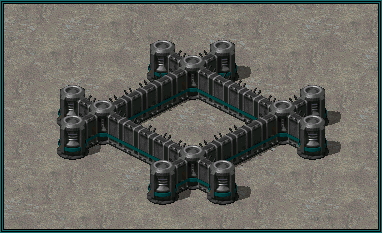 Wall it, or support with other defenses and units. 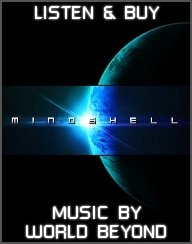 The Foehn Revolt has no problems with breaking into other commander's control protocols thanks to its advanced supercomputers, a strongly developed artificial intelligence system and a few talented people behind it all. 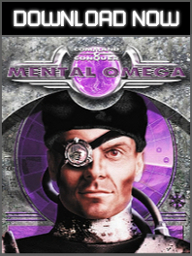 Basing some of their research and new weapon designs on intel acquired directly from their enemies command posts, they've been able to come up with a device that disrupts the signals which are given to their enemies' support power and superweapon control systems and block the transmission of co-ordinate information from the commanders themselves. The Signal Inhibitor will not allow for any support power or superweapon to be launched within its area of effect as long as it is powered. The only exceptions to this rule are the scout powers. Will prevent the use of support powers around it in a radius of 10. Only scout support powers can ignore Signal Inhibitor's jamming. This structure is unique to Last Bastion. 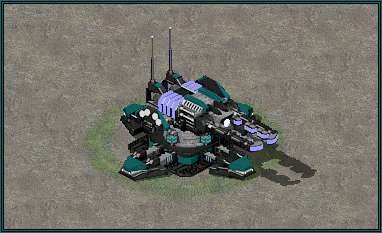 There is no more powerful stationary defense than the Last Bastion's Plasmerizer, probably the largest cannon ever designed. 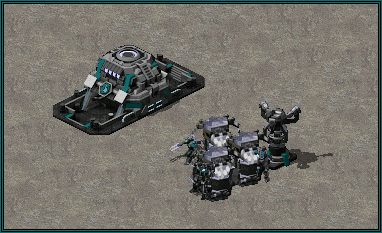 An incredibly large amount of resources was used and continues to be used up for development, maintenance and power requirements of this ultimate railgun emplacement. 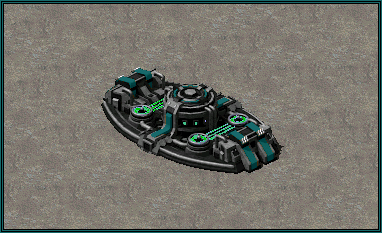 The Plasmerizer has originally been designed in order to eliminate large numbers of enemy tank divisions trying to break through the Last Bastion's walls and enter its area. A number of those protects the gates to the Foehn Revolt's primary origin base against the invading masses, who are unsuccessfully trying to take it down. Once this defense picks a target in its weapon's range, it begins charging the massive plasma railgun it is equipped with, a process which lasts noticeable longer than the Mastodon's, as it collects more power before firing. The Plasmerizer's long-range attack is devastating and has a large area of effect, making it difficult to avoid by moving in any other direction than going back. The cannon has a larger blind spot than the standard long-range defenses due to its large minimum range and requires lots of energy, which is why the Last Bastion's commander know not to rely on its pure firepower alone. Needs to lock on target and charge before firing its weapon. With the Blast Furnace built, the Foehn commander can begin expanding the network of Blast Trenches around his base in order to create the foundations for a steam barrier known as the 'Blasticade'. 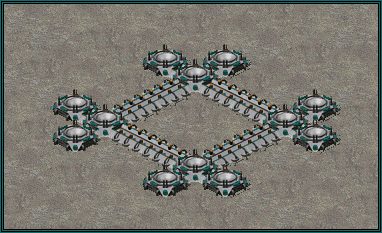 The Blast Trench is built in a fashion similar to the standard walls and once the Furnace's superweapon is activated will become impassable for ground units and will destroy and aircraft that tries to fly over it. If there are any objects during the Blasticade's activation, those will be destroyed as well. For the duration of the superweapon, the Blast Trench becomes completely invulnerable. The Last Bastion has many tricks up its giant Alaska-encircling sleeves and has developed a wide array of defensive weapons to use against its seemingly everlasting enemy. Under the guise of many nights, the Bastion's troops were able to deploy numerous M.A.D. Mines around the base's walls. 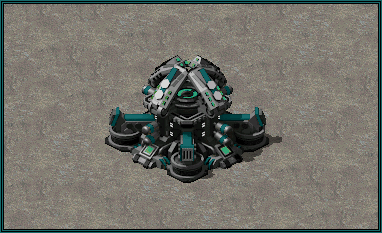 These mines were designed to quickly react to any enemy movement and explode violently with a powerful plasma warhead that has a large radius. Unlike the grids or mines that belong to other factions, M.A.D. 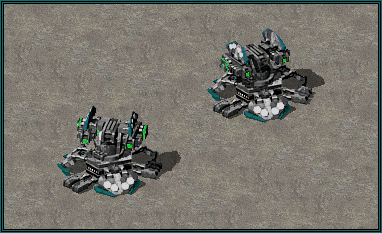 Mines are placed singly and require plenty of resources to be built. They are however able to take out a large tank divison in the blink of an eye. Be careful, as they might heavily damage your units by accident too. This structure is unique to Wings of Coronia. The Harbinger Tower allows the Wings of Coronia divisions to communicate with the Harbingers scattered around the major regions of the world. Once communication with a Harbinger has been established, it is possible to summon it to a certain location on the battlefield so that it can perform a powerful particle collider bombardment at the designated area. Summon a Harbinger to bombard a designated area with its powerful particle collider. The Harbinger is capable of destroying even a Construction Yard if it manages to land all of its attacks on it during each of its 8 runs, though this is difficult to accomplish. Read more about the Harbinger here. Once the Knightfall Protocol is applied to a Foehn Barracks, it becomes possible for the Coronian commanders to quickly deploy infantry reinforcements through drop pods straight from Coronia. 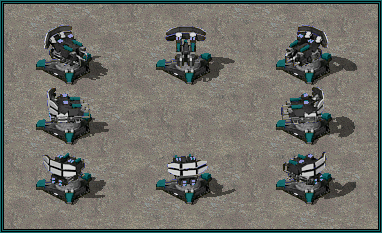 The beacons which are used to control the drop pod landing operations can only be created near the upgraded Barracks, so if a Foehn commander wants to create more Knightfall drop zones, he needs to construct additional Knightfall Protocol upgrades for Barracks scattered around the battlefield. 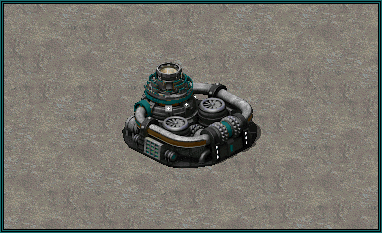 Use this to create a beacon near one of the upgraded Foehn Barracks which will mark the designated target for the drop pod landing operation. The pods delivered through Knightfall will contain up to 15 total troops consisting of Knightframes and Lancers and will continue to be delivered for a short period of time, unless the Knightfall beacon is destroyed during the process.